I know, I know, I just made a pretty fantastic crumb coffee cake, so why would I try again after being so satisfied with that recipe? Well, it all came down to a trade. After a bout of wii boxing and the fact that at that moment, unbeknownst to me, I was coming down with the flu of a lifetime, my muscles were crying foul. I wanted a massage. My partner-in-crime wanted cake so a deal was struck. Turns out I may have had the best deal of all, since I got a fantastic massage and a share of the cake. Hey, I’m a believer that there is no such thing as too much cake. And oh boy, oh boy, what a cake! Incredibly light textured—perhaps due to the fact that olive oil replaces stodgy butter in this recipe—and to what effect! Light as a feather, indeed. Plus, the orange flavour is bright and fresh and melds beautifully with the cardamom, nutmeg and cinnamon. And did I mention that it’s easy to boot? Yup, just take care to read over the recipe and reserve some of the dry mixture as the topping! I’m still ravaged by the flu and I’ve lost my voice. And it’s tee shirt weather now that spring has finally hit Vancouver…but I’m too sick to be outside to enjoy it. But at least I still have cake! Oh and if you are in sunny warm Vancouver today, be sure to stop by the I *heart* Crafts bazaar at 805 East Pender until 6pm in beautiful Strathcona. Althought I’m sick, my friend Mel has graciously offered to man my table. So stop by, purchase some handmade goods, and say hi! 1. Preheat oven to 325 degrees. Lightly butter and flour a 8 or 9 inch round or square pan. Set aside. 2. Stir flour, sugar, orange zest and spices in a medium sized bowl. Add oil and orange juice and stir lightly until mixture forms clumps. Remove 1 cup of this mixture for the topping and set aside. 3. In another bowl, combine the yogurt, egg, vanilla, baking powder and baking soda until blended. Add the flour mixture to the yogurt mixture, stirring until batter is smooth. 4. Pour batter into prepared pan, and sprinkle with the reserved cup of topping. Bake for 40 minutes or until cake tester comes out clean. 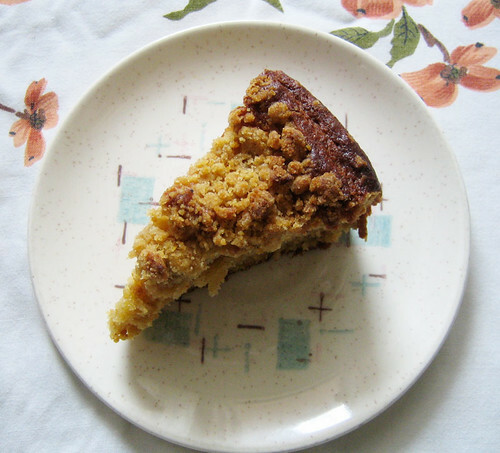 You can NEVER make too much crumb cake – love this orange variation! Get well soon! Can’t wait to try this one too! Maybe tonight! The aroma of the orange wafting throughout your apartment must have been incredible! I have got a cold and am attempting to keep it at bay with plenty of Vitamin C and garlic stuffed jumbo olives (lol)and fresh ginger tea. I’m sure this cake must contain some healing properties in it too like Vitamin C. So it’s good for you too, right ? 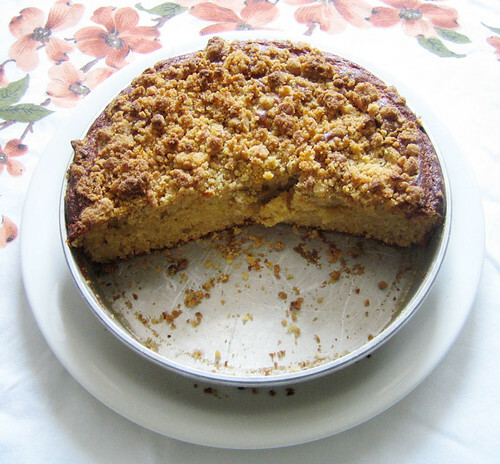 Using olive oil in cake is a Greek tradition. Just about everything from meals to desserts has got olive oil in it. They seldom use butter. I think I’ll make this orange crumb cake when I have regained my sense of smell. This looks great! I love the idea of using olive oil. I was there, saw your table, bought a card. I hope you can feel better soon enough to enjoy some sun and warm weather before it’s gone! I love that you are sick and can still bake! That is dedication. Though a free massage would make me bake too! the cake looks good, hope the massage was too. Hope you feel better soon! This looks really good. I don’t think I’ve ever had an orange flavoured cake. Nothing that features orange for sure. I’ve starred it to try it later. Thanks! Ok, I´ll call you crazy, if you like, but this sounds like the sanest, best thing ever. I can´t wait to try it. I like incorporating other fats besides butter in baked goods.You get such a different texture. Plus olive oil is heart healthy so you can excuse a couple more slices 🙂 I’ve fallen in love with grapseed oil, I bet it’d work well here too. Get better! I hope you’re feeling better and back on your feet. The cake looks really good! You sell homemade crafty goods? Go you! I hope you made a ton of loot from the bazaar. Stumbled across this blog and man oh man does the food look fantastic – salivating just thinking about it. Hope you’re feeling better and that you made some nice cash at the bazaar! I am totally picking up an orange and some yoghurt on the way hhome from work to make this tonight. Feel better soon, though. The flu is a wretched thing. Oh jeez! I just made the apple one with baking powder and it came out delish. Now I still want to give it a shot without BP, and you’ve gone and made me want to try this cake too! I am sooooo making this! hag, i baked this just before i got sick…but i could tell it was coming down the pipe! jenn, this is so easy to bake and totally worth it. bijoux, it was pretty delicious smelling and tasting 😉 i think i’ll have to try the jumbo garlic stuffed olives…eee! thanks rachel, it’s great with olive oil! tho, i wouldn’t use a bitter tasting oil. amanda, yes, you can definitely eat a few slices of this! psychgrad, the orange really works here…more delicate than a lemon cake. thanks rach, this particular flu is nasty. liberal foodie, i sell cards on my etsy store and figured i’d try my hand selling in real life! too bad i was sick. thanks for the kind words, slowplum! jessica, glad you made the cake and i think you should give this a shot too. if i’m eating a lot of cake, someone else should too! thanks patrica, it’s a great lil’ recipe. I made this last night, and it was so yummy, moist, and orange-y! Thanks so much for the recipe! My crumb topping didn’t stay on top like yours, though–it sank, for the most part, into the cake itself. What do you think I did wrong? I want mine to look gorgeous like yours! I have a recipe similar to this I’ve been meaning to make for months (oj + olive oil combo) after my friend brought one over to my house (in September! yikes!). This one sounds even nicer because it has the crumbly topping (and I love that I already have all the ingredients at my house – love those kind of recipes!!!). Looks good. I admire your dedication to cooking. I’m so sorry that you’re still sick. That’s the pits! But you still made this amazing cake. Good for you. Wow. It does indeed look light as a feather. It was snowing her in London 5 days ago so it’s hard to imagine t-shirt weather but I am definitely craving this cake. wait, i can bake, and i need a massage. I was searching the net for some inspiration (grocery day tomorrow), and found your blog. Thanks for the lovely, yummy, mouthwatering ideas! This was lovely! I made it this afternoon with my son and we both commented on how wonderful it made our house smell. The only change I made was to substitute sour cream for the yogurt, since I didn’t have plain yogurt on hand. Worked great, although I imagine the “tang” wasn’t the same as in your original version. We enjoyed this tonight for dessert, but you can bet I’ll be eating a slice for breakfast tomorrow! 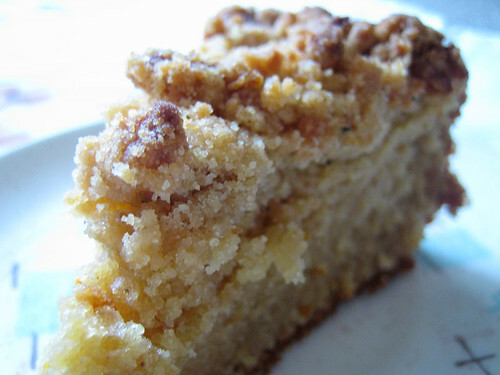 The cake it light, the flavor of the oranges and the individual spices really shines through, and the crumb topping is delightful. I ended up having to bake mine for 50 minutes, though, before the cake tester came out clean. Many thanks! This recipe is a keeper! ivy mae, maybe your oven didn’t preheat enough before baking or maybe your oven isn’t hot enough. try adding your topping 30 minutes into baking next time! maija, oj and olive oil is a great combo! Cookie baker Lynn, i made the cake just before i got sick. so it was a nice treat when i was laid up in bed! helen, strange weather all around! we had it snow here last night! in april. insane. theresa, thanks for stopping by! Made this last night for today’s staff meeting and it was a big success. The flavors are mild but distinct, the texture a perfect midpoint between fluffy and dense. I reserved rather less than a full cup of crumbs, and then added a little more flour to them as they seemed like they might melt away as Ivy Mae’s did, and there was quite enough crumb. Thanks for an excellent recipe. I am late to the party again, Kickpleat. I bookmarked this ages ago and stumbled across it just now in searching for a sweet something to our “Second Christmas Brunch” we are having today on NYE. I was ill prepared and so made some changes and it turned out divine. Gotta love a forgiving recipe. Used half and half coconut oil/olive oil. No plain yogurt in the house so used the maple yogurt my little guy loves in his school lunches. Added chopped, toasted pecans in the topping because we’re nutty. Thank you for another winner. It is really delightful. I added blueberries and my husband is still raving about this cake! Thank you so much for this recipe!